Manchester University gave out a record 7,000 books on Friday evening during FunFest by the River. In 2014, the University gave away more than 5,000 books at the North Manchester event. “Our goal is to increase literacy, and this is our gift to the community,” said Carole Miller-Patrick, director of Manchester University’s Center for Service Opportunities. The books, provided through a literacy partnership with Better World Books, span all reading levels. They were given away free at the Manchester University booth on Market Street. 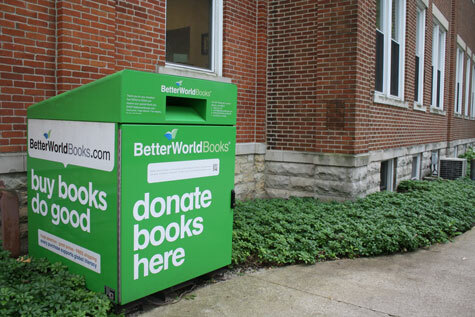 Over the past year, Manchester University employees, students and neighbors have deposited thousands of books in a Better World Books bin behind the Administration Building on College Avenue in North Manchester. Better World collects and ships the books to communities around the world. It also sells them at extremely reduced prices in its Mishawaka, Ind., outlet store and recycles unusable or damaged books.